First picture is nothing, second may be the start but could also be nothing...cant feel it from here. Could easily be nothing on both. Also, if I may add. You say only front toss and tee work...but this could have 2000 hits on it...correct? Core....you bring up 2000 hits... how many "hits" is a bat typically good for. 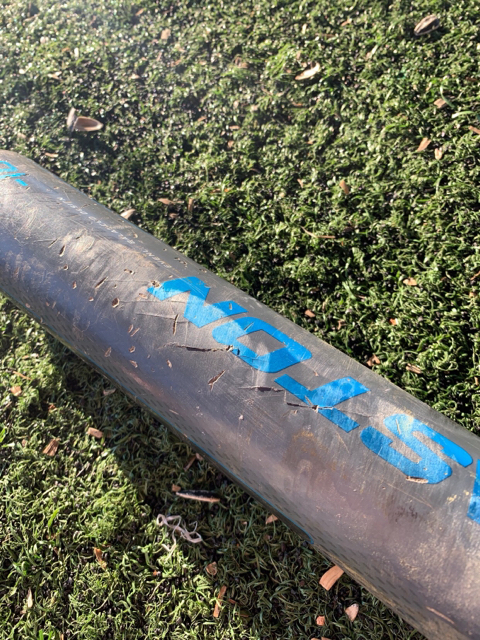 I ask be cause we do a lot of off season hitting and my DD's bat gets used a ton. Need to know if I should be considering a replacement options sooner than later. Not the ASA version but I think my 10yo kid has managed to crack her Easton Ghost in two months of indoor front toss and tee work. Those look like it’s just the paint cracking a bit. My DDs had a few of those soon after getting to regular travel play. It finally bit the dust with the dreaded shark tooth crack pattern. Easily 10000+ hits on the bat from school ball, two fall seasons, and one and half Summer seasons. Got it in June ‘17 from Core. Yours should be smokin. Should be fine for while. sb03dad - now that sir is a busted bat! Looking forward to seeing how Ghost performs. So far we have bought a new bat just about every season. Looking forward to getting on the dirt 2019. Thanks Core. 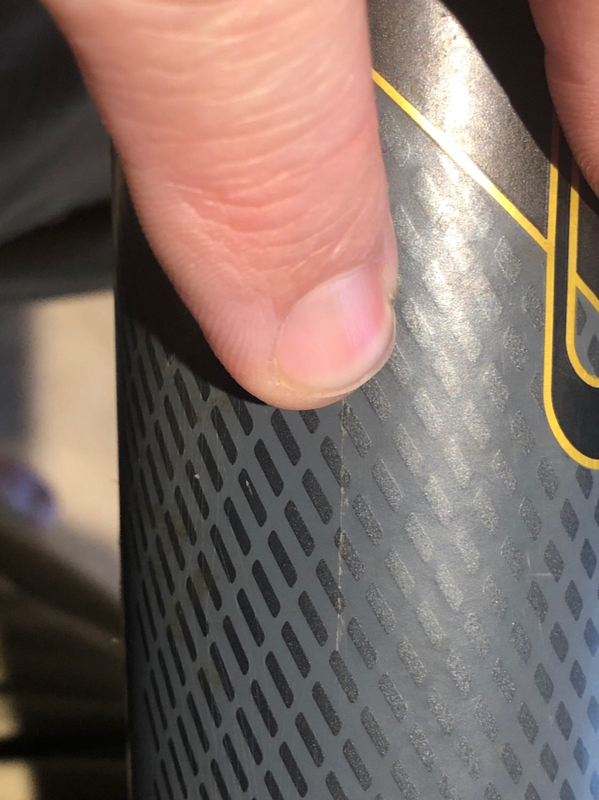 Linear cracks are exactly on opposing sides of the barrel. One side is more or less flat but the other has minor displacement (one side about a thumbnail higher than the other). As far as usage, we are probably in the 2,000-3,000 hits range. Didn’t think much of it as it was the same pace we had with her Demarini CFX and she is only about 4’4” and 60#. She isn’t exactly hitting the ball a ton. That is exactly what ours looked like - after 1 .5 tournaments. 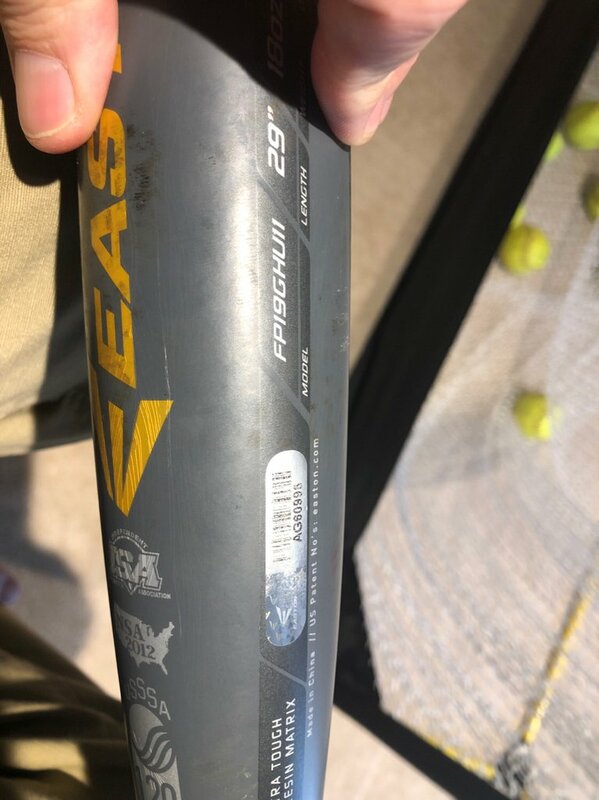 Umpire noticed it when checking the bats on Sunday and wouldn't let us use it... didn't get the replacement from Easton until after the season was done. Really depends on the tournament. DD's looked like that at ASA nats in Seattle and they didn't even look twice. Actually it looked the same all through hs season too. Not imply that I wasn't worrying. I was. being honest, I don't think either of them is anything and it will hit for a while still. Will the "right" umpire maybe say something, possible. You could really feel the line on ours - like the bat wasn't really round anymore, but rather a little tear drop shaped.